First of all, I’m a very healthy eater. I feel the need to preface this post with some desperate clinging to my gastronomic morals. While I love to taste sugary treats, I don’t usually indulge in more than a few bites. On the morning of my birthday, I could be found floating on my back, languidly moving through the Copper Creek Springs pool at Disney's Wilderness Lodge Resort. There were few people out that early, save for the one mom who kept throwing her son’s diving rings in my general direction. Thanks, lady. My husband returned from the Roaring Fork quick service with my customary hot tea and surprised me with my first bday treat: the Luxo Ball Brownie! If you’re looking for an adorable insta-worthy treat, this is it. The technicolor fondant top looked just like Pixar’s Luxo Ball at the new Toy Story Land in Hollywood Studios. I had to hop out of the pool right then and cozy up to this brownie at a nearby table. But I soon found out that it’s not just a brownie. In fact, a week later, I’m still not sure what it should be called, but “brownie” seems like a gross undersell. First off, the Luxo Ball Brownie is so big that it has to be taken apart to eat it. Just pull that ball right off the bottom to separate… there’s a slab of chocolate there that makes it easy for you. Life would be a better if slabs of chocolate helped guide us in all things. Let's take this layer-by-layer. For science! 1. The bottom chunk is a hearty brownie with a thick chocolate icing. This the kind of brownie that takes a full second to bite through. 2. The chocolate icing had a distinct cocoa flavor (unlike many icings, which just taste remarkably like sugar). Gotta give props when that happens. On to the top, (and my favorite) chunk! The Luxo ball! 3. The Luxo ball fondant was thick and well, fondanty. If you're a fan of wolfing down fondant, this layer is your heaven. I'm just a fan of staining my teeth and chin red before starting the day, so everyone wins. 4. The fondant lays on a white chocolate shell. I barely knew this was there until I felt a lil crispy resistance on the second bite. 6. Chocolate hazelnut ganache center. This is the prize at the center of the Luxo Ball Brownie. If there are any Nutella fans in the audience, this is probably the last thing you'll read before hitting the jar. 7. The chocolate floor, a.k.a. the MVP of the Luxo Ball Brownie. You need a crunchy layer to break up all that flavor and add another texture to the mix. This chocolate slab is enough to not only contain the top chunk as you eat it, but also to make sure you're not just slurping down mousse mush. From my instagram story, before I even realized the white chocolate shell! The Luxo Ball Brownie is served chilled, so you get that nice cool mousse flavor and the crisp of the chocolate layers. Definitely a decadent poolside treat, but snap pics and eat it fast -- a treat this complicated is destined to melt. It’s priced at $5.99, which seems like a lot at first for a snack, but seriously, you can share this thing with a few people. It counts as 1 snack credit on the Disney Dining Plan! If you're a credit counter like myself, you know this one is a good use of a credit. Later that day, my husband would bring me a few more birthday offerings. 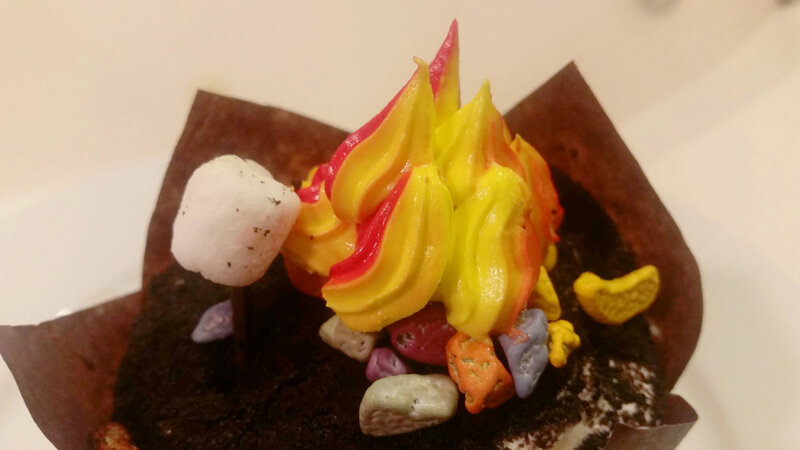 The Campfire Cupcake ($5.49) from the Roaring Fork is covered in cookie “dirt” crumbles and has cute firey icing with a mini marshmallow on a chocolate stick. The cake inside is chocolate with a chocolate ganache filling. It was a little too chocolate-on-chocolate-on-chocolate for my taste, so after a few bites this one went to the dessert disposal (kids). The Campfire Cupcake is great for surprising the kids at the end of the day after they’ve roasted marshmallows at the Wilderness Lodge campfire. An often-overlooked treat at Roaring Fork is the Fruit Croissant ($3.69). It may look like a healthy treat at first, with blueberries and raspberries poking out conspicuously, but make no mistake. This is a high-caliber dessert with a chilled creamy filling stuffed inside of a sweet croissant. The Fruit Croissant is also much cheaper than other treats in the sugar case at Roaring Fork, so a fine choice if you’re watching your dessert budget. I suggest this one for a mid-day treat to share with a hot coffee. These three treats are all available at the Roaring Fork quick-service at the Wilderness Lodge Resort. It is located right by the Seven Seas Lagoon, so if you’re looking to photograph or just munch on some special treats, it’s not a far bus ride from the castle. The resort is a wonder in itself (even though visitors can’t swim in the pools), with a spewing geyser, wooded trails, and boat and bike rentals. The famous Whispering Canyon Cafe is located here as well as the fancy-schmancy Artist’s Point restaurant. Head to Wilderness Lodge after a Magic Kingdom day to grab a treat at sunset and watch the Electric Water Pageant go by. These were just a few of the treats that magically (read: husband) appeared in my hands on my birthday at Disney World. The crew at Starbucks even gave him a free Mickey ear cupcake and birthday candles in his hour of need. Who could ask for a sweeter birthday? Are there any treats I missed? Let me know!